Fruity-sweetness canned? Check. Finished ferments bottled? Check. Well, then it is probably time to check in on my newest batches! Blackberry! Blueberry! Cherry! It is probably worth mentioning that everything went smoothly in setting up these ferments. In a previous post, I detailed to the point of adding the pectic enzyme. 26 hours later, I added the yeast. I divided 2 packets of Montrachet yeast between the 4 gallons, and prepped the yeast as normal otherwise. The next morning, I had bubbling goodness. Having thus been a week, today was the day chosen to rack. After sanitizing the jugs with a Star San solution, I started with the cherry. 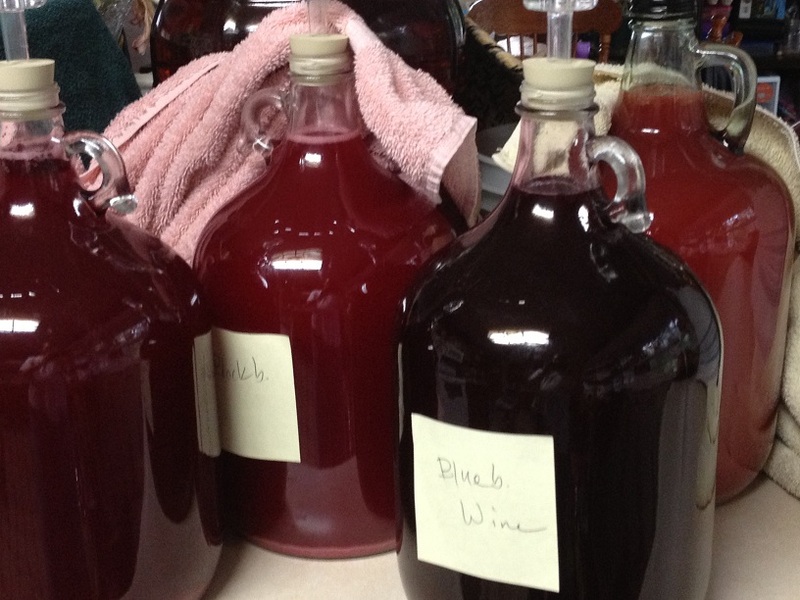 The blackberry came next, followed by the blueberries (wine, then melomel). Progress in all but the case of the blueberry wine was indicated by the relative dryness of the must to the taste. The blueberry wine, on the other hand, is still quite sweet. The blackberry was noticeably puckering in the back of the mouth. I haven’t noticed such a feeling to this extent in any previous batch I have made. But otherwise it was good. Not done, but acceptable for this stage. I have noticed that sometimes it takes quite a long time before the racked ferments get back to bubbling visibly. Not so today. Within minutes, there were streams of bubbles in each gallon. So many bubbles, in fact, that white-ish pink bubble “foam” rings formed in each jug’s neck. The blueberry wine is noticeably darker than the blueberry melomel. That was a little surprising. There is not a huge difference in color between the cherry and the blackberry; and the blackberry has a lot less sediment in it. As is typical, I did a terrible job of staying off the lees in the plastic bucket, so in the next couple of days I probably need to rack again to get the must off the excess material. Anyway, that’s about all the observations I have for now. Now it’s time to do laundry. Ugh. This entry was posted in Fermentation Log and tagged blackberries, blueberries, Cherry, melomel, pectic enzyme, potassium metabisulfite, starsan. Bookmark the permalink.